A Japanese H-IIA 204 booster carried out the country’s first dedicated commercial satellite launch on Tuesday, Nov. 24, 2015. The rocket with the Telstar 12V spacecraft thundered off the launch pad at the Tanegashima Space Center at 15:50 JST (06:50 GMT) – almost a half hour later than planned. This delay was caused by an all-too-familiar culprit. The payload for this flight was the U.S. Telstar 12V (Telstar 12 Vantage) satellite which will replace the aging Telstar 12, currently occupying the 15 degrees West position in geostationary orbit. According to a report appearing on NASASpaceFlight.com, the Telstar 12 spacecraft has been on orbit for 16 years. The 27-minute delay was caused due to a ship that had drifted into the restricted waters downrange. Once this issue had been cleared, the rocket’s first stage LE-7A engine finally roared to life. At about one minute into the flight, the H-IIA passed Mach 1 at about 43 miles (70 kilometers). After two minutes and 7 seconds, the first set of two SRBs exhausted its supply of solid propellant and fell away. Ten seconds later, the second pair fell away towards Earth. Four minutes and 40 seconds into the flight, at an altitude of about 103 miles (165 kilometers), the four-meter-diameter payload fairing was jettisoned from the rocket revealing the Telstar 12V satellite. About six minutes and 40 seconds into the flight, the first stage’s engine shut down as planned. Staging (when the rocket’s two stage separate) took place about eight seconds after that. Six seconds later, the second stage’s engine activated. The second stage’s LE-5B rocket engine carried out three burns, the first lasted for about four minutes and 12 seconds, placing the spacecraft into a temporary “parking orbit”. About 11-and-a-half minutes after the first burn had completed, a second burn, lasting about four minutes, was conducted. This placed the Telstar 12V spacecraft into geostationary transfer orbit. Finally, a third burn was conducted as the spacecraft was at its apogee (the furthest distance in its orbit), raising the spacecraft’s perigee (the lowest point of its orbit). About three minutes and 30 seconds after the end of the second stage’s last burn, Telstar 12V separated from the H-IIA 204’s second stage, concluding the flight. 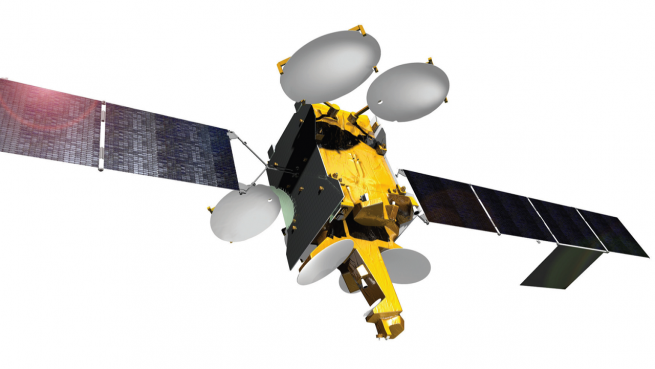 The Telstar 12V satellite is based on the Eurostar E3000 platform and is produced by Airbus Defense and Space through a contract awarded by Telesat in August of 2013. If Telstar 12V operates as advertised, it should expand upon the capabilities of its predecessor. According to a review of the spacecraft on Gunter’s Space Page, the new satellite will provide telecommunications services in Europe, the Americas, the Caribbean, and across the South Atlantic region via 52 Ku-band transmitters. The spacecraft weighs in at about 10,800 lbs. (4,900 kg) and will operate off of 11 kW of electrical power by two deployable solar arrays. The satellite is planned to have an operational life of approximately 15 years. Japan has been late to the commercial launch services game. This will mark the first time that the nation has carried out such a mission. It did not, however, mark the first time that the H-IIA booster was used. Taking to the skies for the first time in 2001, the H-IIA variant of the H-II booster has been launched 29 times with one failure in 2003. The rocket has launched an array of different missions ranging from sending payloads to geostationary orbit as well as on deep space explorations missions such as to the planet Venus. 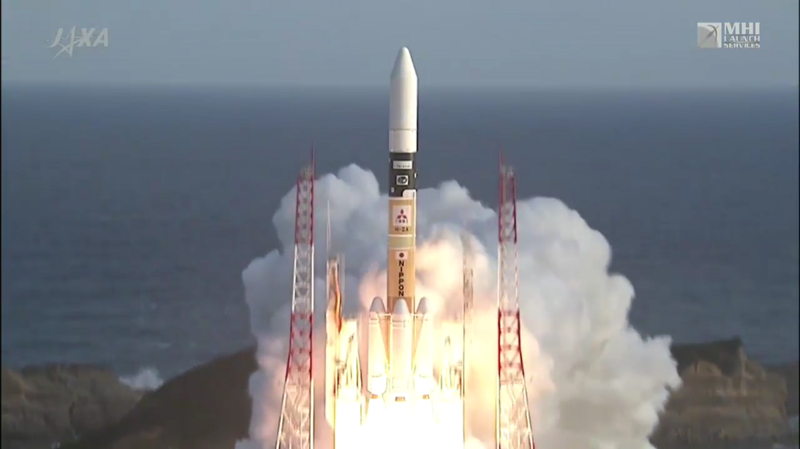 This will mark the final 2015 launch from the Tanegashima Space Center. The H-IIA is manufactured by Mitsubishi Heavy Industries and is operated on behalf of the Japan Aerospace Exploration Agency (JAXA). Fueled by liquid hydrogen with liquid oxygen as the oxidizer, the H-IIA used for this flight included four SRB-A3 solid rocket motors (hence the last digit in the H-IIA 204’s nomenclature). The “2” in the booster’s designation denotes that this is a two-stage rocket. The launch of Telstar 12V saw some modifications made to this rocket’s second stage. According to NASASpaceFlight.com, one such upgrade made to the booster’s second stage included a more efficient turbo pump cooling system. Additionally, modifications were made to the attitude control system to allow evaporating propellant to provide some thrust during coast phases – a job formerly relegated to a Reaction Control System.